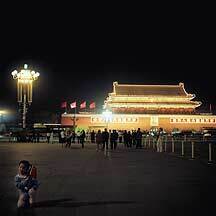 天安门广场Tiananmen Square was built after the establishment of the People's Republic in 1949. Three gates between 天安门Tiananmen Gate and 前门Qian Men (Front Gate) were removed to expand the space for this public square. With its 440,000 square meter area, it is literally capable of packing a million people. In the summer you can expect a full square of people flying kites or, more often, sitting around; in the winter, however, there is not a kite. 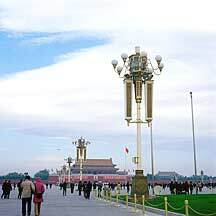 But whatever the time, once in Beijing city, it is difficult not come in contact with the square: It is a mecca and magnet that draws things and events to it. 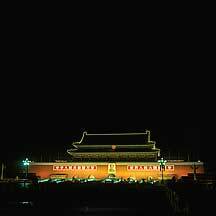 Tiananmen was built in 1417 during the Ming dynasty(1368-1644). 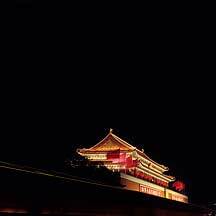 It was originally named 承天门Chengtianmen, but the Qing emperor renamed it to its present name in 1651. 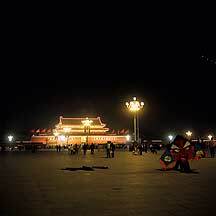 Tiananmen was built in 1417 during the Ming dynasty(1368-1644). 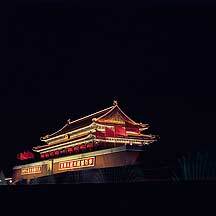 The gate was originally named 承天门Chengtianmen, but the Qing emperor renamed it to its present name in 1651. 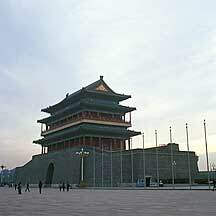 There had been numerous renovations on the gate since the establishment of the People's Republic in 1949. One of the set of large characters gracing the facade of this gate. It reads "Long Live The People's Republlic of China"
One of the set of large characters on the gate's facade. It reads "Long Live World Unity"
The very large portrait of the revolutionary leader. kite flying is a popular pasttime in this big square. This large granite obelisk was completed in 1958. Its surfaces have bas-relief carvings and writings of important revolutionary events within the last hundred years in china. 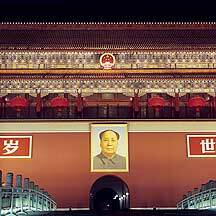 The large calligraphy are that of Mao Zedong. Also included are the calligraphy of Premier Zhou Enlai. 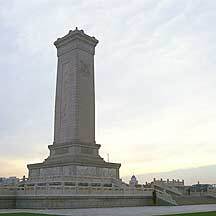 The guarded monument sits on the center of the square. 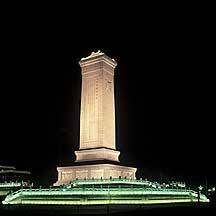 前门Qian Men consisted of two towers:Jian lou and Zhengyang Men. 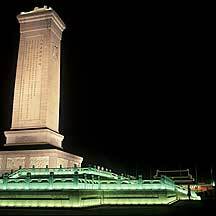 Jian Lou is the southern tower. 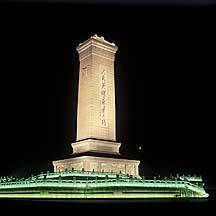 前门Qian Men consisted of two towers:Jian lou and Zhengyang Men. 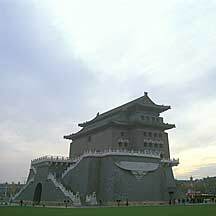 Zhengyang Men is the northern tower. Completed in 1440 during the Ming Dynasty. 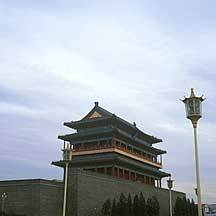 It is the tallest of the nine major gates constructed about the same time. 前门Qian Men consisted of two towers:Jian lou and Zhengyang Men. 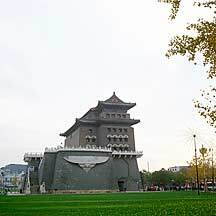 Zhengyang Men is the northern tower.